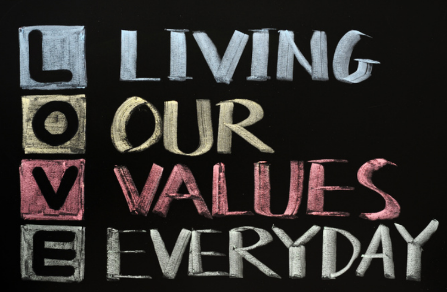 Our St. John's Values are Christian Values which underpin the Ethos of the school. We focus on a different value each half term in our Collective Worship assemblies and our reflective areas in the hall and our classrooms help us to relate to the theme at different points in the day, encourage us to take time to reflect and think about what is going well as well as allow us to spend time talking to God through prayer. Children receive compliments from members of staff if they are seen to be living out our school values. Children encourage each other to gain compliments and each classes are added up every week and this is shared in Praise Assembly. At the end of each half term the class with the most compliments has a treat of cakes and shakes. We also have a Citizen of the Week Award which is given to 1 child every week who has been a fantastic role model to others living out our school values. Children are also encouraged to live out the values at home. A values record card in the children’s reading record can be filled in by a parents and/or child when they have shown how they have lived out a value at home. Once a child has shown they have lived out all the values on the card they receive a bronze star, if they complete a second card a silver star and a gold for a third card. Children who receive a gold cross will be our Values Ambassadors. 14th September- Well done to Darci who has received our new award- Citizen of the week- for living out the school value of Compassion at home. She arranged a charity day to raise money for a child to go to America for an operation and raised £600. 21st September- Well done to Rosie who despite having an emotional Friday due to her Grandfather’s illness still worked hard and helped others around school. Your Grandad will be very proud of you! 28th September- Anya has shown great compassion this week. She had her long hair cut and has donated it to the Little Princess Charity which will make her hair into to wig for children who are suffering from cancer or Leukemia. 5th October-Lucinda- Well done Lucinda for showing compassion and love towards others. Lucinda did jobs around the house to earn money and added this to her spends to buy products for the blessing bags we are putting together with church for the homeless. 12th October- Lyle- for donating all the 1p in his money bank to pay towards adopting the tiger. £9 in pennies.Well done Lyle! 19th October- Well done to Sasha and Summer who made Summer’s mum stop the car to help an old lady they noticed who was confused and lost. She was walking the streets in her slippers and had Dementia. The lady stayed in the car and the girls were very sensible and talked to the lady to make her feel safe. The police came and took her back to her care home. You really helped keep this lady safe and showed great love and compassion in a difficult situation. 2nd November- Amy- Continually living out our school values- she is a fantastic member of our St. John's family and a super role model to us all- she is always thinking about others and tries her best to help. She is a ray of sunshine and thinks positively even when things don't go well. 12th November- This week’s award goes to our KS2 Choir who sang beautifully at the opening of the All-In-One Christmas Market last Friday evening. They all sang their socks off, wore festive hats, gave up their own time after school and more importantly represented our school in an excellent manner. We had lots of lovely comments from parents, grandparents, staff of the Garden Centre, stallholders and customers. A great sense of togetherness and respect shown by all! 16th November- Raea (Reception): She showed great compassion when she bought a McDonald’s Happy Meal for a homeless man she saw when she went to get a milkshake treat with her daddy after dancing. She really thought about the needs of someone else and helped them. Well done, Raea! 23rd November- This weeks Citizen of the Week is Lilly (Inventors), who is collecting coats for the homeless. Well done Lilly for being so thoughtful and thinking of people less fortunate. If you have any coats you wish to donate, please pass them to Lilly for her chosen cause. 30th November- Ben Watkinson for bringing in the first gifts for our appeal for Hits Radio’s Mission Christmas and for bringing in a gift of hope for our first week of Advent. 14th December-Lexi Partridge for thinking about what a homeless person might need and buying very think warm socks for a man sat outside Tesco to keep his toes warm.